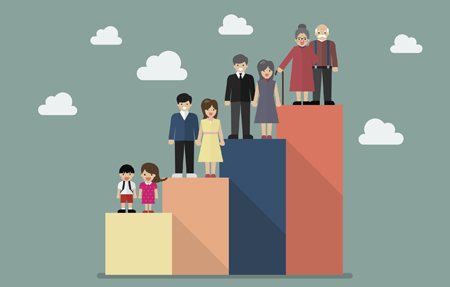 The latest Superannuation Market Projections report, recently published by independent consultants Rice Warner, forecasts that the number of members with retirement accounts will rise by almost 70 per cent over the next 15 years to more than 3.7 million. And the total value of retirement assets in super is expected to grow from $828.9 billion (as at June 2017) to $1.335 trillion in 2017 dollars over the same period. However, the retirement segment of superannuation is not a story of straight-out growth. There are interesting dynamics occurring. Rice Warner projects that retirement segment's share of total superannuation assets will reduce from 35.6 per cent today to 31 per cent over the next 15 years. This expected dip in market share is largely due the combination of retirees drawing down on their savings, and the growth in assets and members in the accumulation phase. An even higher proportion of retirees in future are likely to take their super benefits as a pension rather than a lump sum – further breaking down the myth that Australia is a lump-sum society in regards to super. “With the [superannuation] industry's focus on member education, improved financial literacy of the general population, and retirement products aimed at helping members preserve retirement assets, we expect a decrease in the rate of lump sum benefits at retirement,” Rice Warner comments. Over the next 15 years, the proportion of members taking their super as pensions rather than lump sums is expected to reach 90 per cent, “resulting in a positive cash flow in the long term” for super's retirement sector. It is anticipated that the biggest change will occur in the market share of the retirement dollars held by the different superannuation fund sectors. Rice Warner forecasts that the market share of retirement assets held by the various fund sectors to significantly change over the next 15 years to: SMSFs, 44 per cent (58 per cent today); industry funds, 18.9 per cent (7.6 per cent today); commercial retirement products, 29.4 per cent (26.1 per cent today); public-sector funds, 7.8 per cent (7 per cent today); and corporate funds, nil per cent (1.3 per cent today). The expected reduction in the proportion of retirement superannuation dollars held in self-managed super is readily understandable given that SMSFs hold by far the biggest market share of retiree super savings. SMSFs will therefore experience the largest proportion of retirement drawdowns.